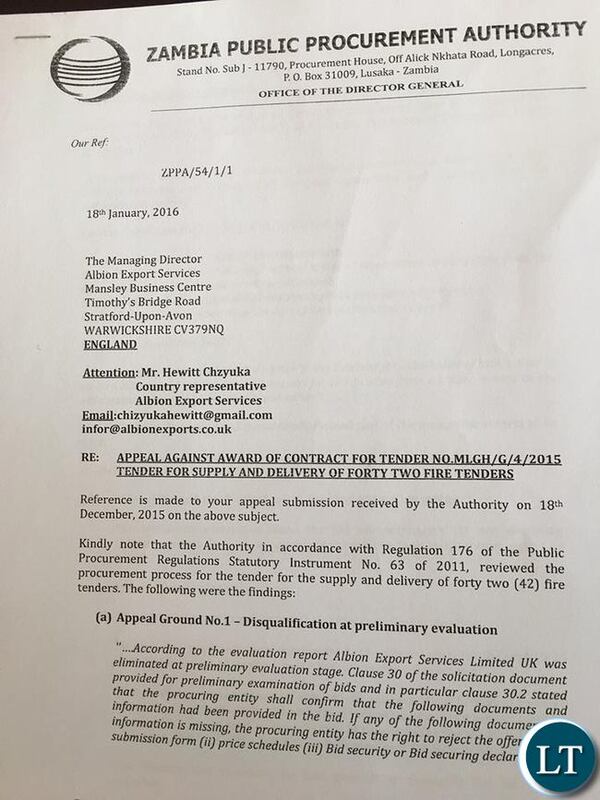 But Albion Services disputed the award and appealed to the Zambia Public Procurement Authority(ZPPA) objecting to the award and claiming that since they had put up an unsolicited bid in 2013, they had incurred costs and wondered why their bid worth $49million for 42 fire trucks was rejected. We were desperate, we needed them and they had to arrive at a certain time. @Rugby – very true! We elect ignorant leaders at our own risk. We must learn to hold our leaders accountable and that starts from public scrutiny during public presidential debates. We do ourselves untold harm when we elect leaders who have not articulated their agenda for the country and we have no grounds to hold them to account when they are in office! @ Dual Citizen DC, Which “public presidential debates” are those? The ones that drunkard vasco de lungu does not attend? The BIG QUESTION still remains; “Where are the 42 Fire fighting vehicles?” According to stats, It’s now 18 months since the tender was awarded. I quote “On 25th January 2016, the Ministry of Local Government informed Grandview International that all complaints and review by the ZPPA had cleared the project and gave the company authority to proceed with the supply and delivery of the fire trucks and associated safety equipment”. The poor will remain poor not because they do not have money but they do not know how to handle money.I see no justification of paying a $1 million per truck just because someone offered you that price.What kind of leaders do we have? How many lives could be saved in our hospitals if that $1million was spent on them.We do not even have working fire hydrants in our cities so those fire engines are going to look pretty posh parked next to a burning building hey. He looked at picture again, and asked why not your country buy military type, they are good for Africa and cheaper, no luxury of radios, etc? He pointed at one they use in forest fires. 6 guys can be in it. Our Scanias only 3. Zambia we are top sinners, I tell you. This explanation just shows the weakness in our leadership. It is corruption because this company is not even an Automotive Dealer/ Zambian Owned. Stop being defensive and listen to your citizens. Be it Sata or Local Government you have all failed. Problem is that for any Good Intention that SATA had, Leaders in Zambia want to use it as an opportunity to steal. There is no ways those trucks would cost the amounts mentioned. What custom features do they have different to other Fire Trucks?? PLEASE EXPLAIN TO US. but you are here trying to show us that you care for zambians. My foot! !The only reason most of u are talking is bcoz the tender was given to a Zambian company. Pull him down Syndrome. I like it when facts come out. Leave our late president from this nonsense. Sata wanted nothing but the best for this country indeed, yet the money he borrowed for all these he planned for you have put in your pockets and you cant even account for it. So to cover up your sins you are borrowing again and this time double for each project. We know your evils way and we know that these evil deeds, will catch up with you soon. But ba Chishimba, you voted for these guys. You didn’t want a Tonga because you say “ba kaso”. Now you have “free spenders” of your tax money. Sometimes a little bit of “kaso” to national resources, like Magande was, is good. This simply not true…..the fire trucks bought are basic fire trucks ……what unique features ??? The cost of those trucks is in the $700,000 region max. Albion Services sued the government and was awarded costs ????? This is true. Aviation fire trucks have very expensive specialised equipment that costs much, much more than the actual truck. Correct, and those specialist fire trucks can cost up to $1,000,000. Not those basic trucks shown. The true cost is up to $700,000 per truck max. Which means the one’s bought by ZAF were also ridiculously over priced! Whichever way you look at it $1m for each fire tender is way too much. There must be something fishy here.Are they air fire tenders? Are they supposed to be flown? We even import everything from toothpicks, razor blades, fruits, vegetables, clothes, etc. We need to grow up as a country! GENERALLY, EVERYTHING IN ZAMBIA IS OVERPRICED, TAXES, FOOD, MOTOR VEHICLES (INCLUDING SECOND HAND) ONES ETC. THIS IS NOT NEW. IT IS ONLY THAT WE HAVE BEEN POLLUTED TO BELIEVE THAT THERE IS CORRUPTION IN EVERYTHING. OF COURSE CORRUPTION IS THERE. BUT LET US NOT BE BLIND EVEN TO GENUINE PROJECT AND ONLY SEE CORRUPTION EVERYWHERE. So you are saying that this is normal and we should just take it as-is? If so then I say WOW!!! It would have been nice to elaborate on what these ‘unique’ features are. Is Zambia so different from other countries that it needs custom built fire trucks? We must have very special fires. We never manage to put them off!!!! Our interest is more in the procurement than putting out fires. Nevermind them ..a firetruck is just like an Ambulance..you simply ask the Third Party company to equip it with specilised machines. If i approached a company today that modifies 3 trucks a month on their assembly lines for a discount of 3 on a 42 truck order they would happily do that. And someone says that Politicians do not have a hand in this contract…from start to finish its politicians. 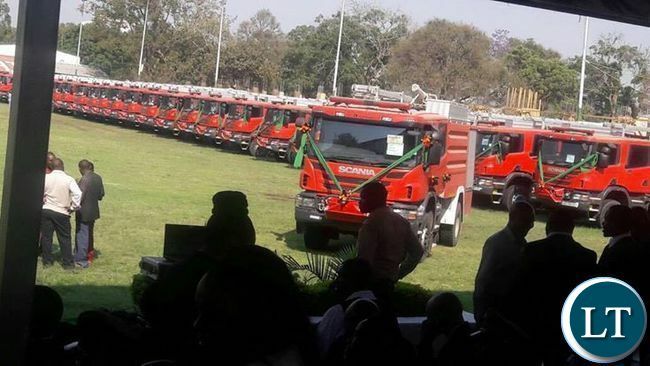 If the govt was seriously about cost saving they would have advertised directly to these Fire Truck Assembly companies in their mahazines and got those trucks directly at less than half a million with discount …instead of a middle man who is simply calling them to do everything like ordering takeaway. 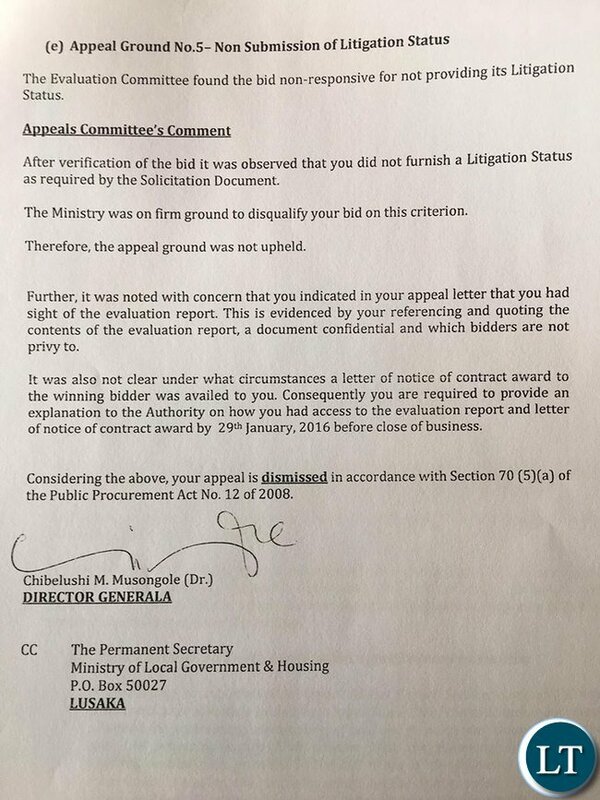 jay jay, your point about writing directing directly to fire manufacturing/assembly companies makes sense but contrary to the ZPPA Act for that level procurement. There was no avoiding public tender which, unfortunately, always yields exaggerated prices. We may have to consider amending the Act! These are middlemen here who have no experience in these fields…just in it for quick buck!! @Spaka like lilo:have you seen the same fire engines?go to Lusaka fire station on church road and you shall them. Already we are being told that ZAF bought some fire engines in 2012 at US$1.3m and other Govnt wings did the same.so these 42 new fire engines at US$1m each are even cheaper!! Just find what to do and let Govnt work in peace.nothing in life comes cheaply! !upnd was busy burning Zambia after losing 2016 elections,so Govnt has done well to buy these machines so that people’s property is protected from upnd thugs!! MANY ZAMBIANS KNOW THAT UPND WORRIES TOO MUCH WHENEVER PF GOVNT DELIVERS A HUGE PROJECT BECAUSE SUCH HUGE PROJECTS PUSH THEIR HH FAR AWAY FROM PLOT ONE!! $1.3 m for Army fire trucks is also robbery for green paint! There is absolute and urgent need to reform our procurement procedures in line with international guidelines. Rejecting a bid for a reason that is not substantive (which will not affect the price of the bid) must be removed from our Act and SI. A good example is where a low priced bid was rejected for non submission of a litigation status., a matter not of substance. The country has incurred an opportunity cost of saving USD $20 million because of insisting that a bidder did not submit a litigation status a matter the evaluation committee should have obtained and the country would have saved USD $20 million. Appoint experienced and internationally exposed people to key positions and you will avoid these grave mistakes. It’s not grave mistakes…..it’s corruption. Period. Spaka like lilo:i always advise you to avoid insults on this fora.lets differ on opinions but not insulting each other. Everyone well meaning tax paying citizen is involved. It’s tax payers money and you might not be directly impacted but your future generations will have pay off this debt. Njimbu you are seriously dull. So people should not condemn the wrong because it’s already done? You will feel it when your wife and child die at UTH for lack of medication, where part of that $42M was supposed to go. Then you can continue supporting this nonsense.. When a potential CEO tells the board he has no clue what to do does the board still go ahead and hire him? lungu told every body he isn’t intelligent enough. Besides he has a nefarious past which also is public knowledge. He steals, period! But Zambians allowed such a bandit to be in charge of their resources! Do you still wonder why a simple truck costs in the millions? Zambians are docile people and they elect utterly dull MPs to represent them…why is nt the Parliamentary commitee calling Procurement Director to explain!! You are justifying theft without shame!! This is the only country were people comment on issues that they have no clue about. All this information everyone is looking for is available at ZPPA who are mandated to handle public procurements. The PS for Local government is also available to shed more light. It seems a number of people have nothing to do hence commenting on every issue. Most councils across the country especially the provincial depend on the same fire engines from ZAF and Zambia airport corporation which in the long run is not sustainable. You guys,you can talk hills and mountains, this government will never listen to your concerns and grievances. More especially this issue of(42 fire tender) and the money is in their pockets!!maaa! !the judiciary is now questionable. Tembo those are the rules of the game which must be followed. If they start ignoring the rules just because someone has quoted cheap then there is no need for tendering, they should just hand pick. And remember cheap is expensive, why should one quote $20m when the highest bidder was $49m? Can someone tell me where Fire hydrants are installed in Zambia?? Where do they even get chemicals to stop any type of fires?? Surely, buying expensive and luxury trucks, which is laughable but the basic requirements in the fire stations are not available, does this make sense?? The people who are even in the forefront have no clue about fire engines, to them it eating time. Definitely, the cost has been inflated big time. What we need is just are water tankers and just mount a water pump. We need to improvise if we have no resources. Spending 1 million on a truck, really?? It was an option to pay half in this year’s (2013) budget and the other half in the 2014 budget, and that seemed to be most acceptable to the council members, who all agreed that public safety was a top priority. “I think it’s necessary,” said Councilman John Lee of going ahead with the purchase. “I’m finally to the point where I agree it’s a priority,” Councilman Scott Tornquist said. “How we work it into the budget, I guess I’d look for a recommendation from staff. I’m more interested in the bottom line. The recovery hasn’t come full circle back to Mason City yet.” He mentioned many Mason City residents are on fixed incomes. Fire Chief Bob Platts explained the need in more detail to NorthIowaToday.com. The Council will discuss this expenditure and others this coming week at its next budget hearing, scheduled for Tuesday evening at City Hall. The first comment is awaiting moderation but it was my search and I found a new fire truck at US $1 million which a city council had proposed to buy! Of course it looks bigger but it was the cost of one fire engine in 2012 in the US. @HaJayJay is justifying HH’s theft!